Home Entertainment Health Lifestyle Why You Should Avoid Green Potatoes? 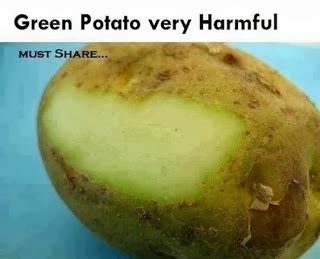 Why You Should Avoid Green Potatoes? Potatoes are good to the body – this is a common result for the research that you will conduct especially if it is done through the search engines. Though this is true, a recent study shows some potential health risks a potato, green potato to be specific can give to the body. With a high amount of solanine which is considered to be poisonous, someone who is able to intake green potato will have the high possibility of experiencing nausea, diarrhea, vomiting, headache and others. Since it is green, there is a high concentration of chlorophyll and study shows that there is nothing wrong with that since vegetables also, I am talking about green and leafy ones have high concentration of chlorophyll. But during the process of increasing the amount of chlorophyll, solanine is also increased, thus, resulting to different health risks. With this record, there is really a potential for green potatoes to promote problems when it comes to health. The fact is this is not an info that is known to all. This is the reason why memes are created and circulated, shared and uploaded via social networking sites to give people a certain kind of awareness of what they need to learn about green potatoes. And you might be reading this post and learned about the said potato in this site. Well, do the action now! Share the photos and stop the threats that this kind of potato may give to mankind.